JMD, a.k.a. John, is a British melodic trance producer and remixer. 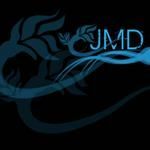 Taking influences from the UK hard trance scene and Dutch and European melodic trance producers, JMD's trademark style combines bouncy, tech-trance beats and rhythms with uplifting arpeggiated synth melodies. The first JMD track was "New Beginning", produced in Autumn 2003. Since then, JMD has produced tracks for Toucan Music and also remixed for artists including sea.envy, Risey, Yakoozai, Redmann, Marc Burt and more.